You are the sea explorer searching for the ancient lost civilizations. You have found some traces of the lost Atlantis near the coral reef island and you are submerging into the sea to know more about it. Deep blue sea reveals all secrets to you. Tropical fishes are swimming everywhere and around you. They are swimming everywhere and even so closely so you think you can touch them. Corals and algae are tangled with each other and having different and fantastic colors and shapes. You enjoy the underwater world and its beauty in silence. In the distance the ancient massive watch is seen. It is covered with slit and tumbledown. This watch is the legacy of the great civilization - huge construction made of stone and metal. Then you notice that the hands are slowly moving. The watch shows the real time! You see and even hear as the massive gears are moving with scratches. This landscape is so mysterious and charming so you watch it and cannot move. Strange but beautiful sounds are coming from everywhere and you don`t believe that this is real. This alternative reality is created by 3Planesoft developers to make people relax from the routine work and help them during the hard working days in the office. 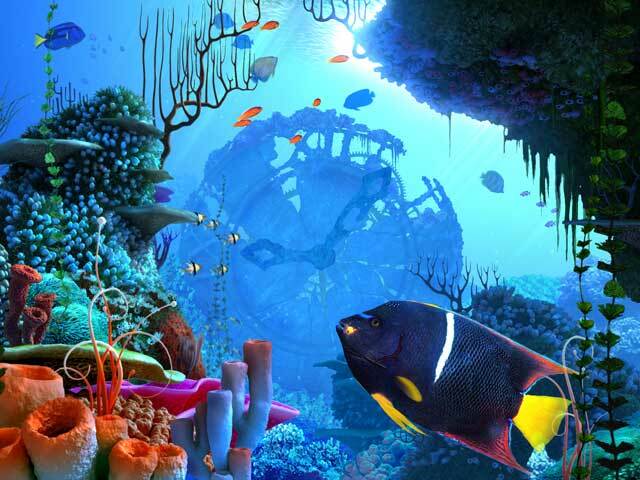 Coral Clock 3D Screensaver brings all your dreams to life - mysterious underwater worlds and ancient civilizations are live inside your PC. Atlantis is found now and it is on your desktop.